Absynth does just about every kind of synthesis available on Planet Earth, including: Additive, Subtractive, FM, Wavetable, Granular, Morphing and Sampling. It also comes fully loaded with a multitude of filters like the Supercomb, Cloudfilter and the Aetherizer. In fact, Absynth 5 does such weird-and-wild, whacked out alien stuff that we at mPV are convinced that its "code" had to originate from a galaxy far, far away. To confirm our suspicions, we've sent out an mPV Interplanetary NED to explore the possibilities. A soft synth of this complexity needs a really clear and grounded trainer. That's why we chose our most down-to-earth, in-house, expert educator, Scott Freiman, to tame this aural beast! Who else but Scott could make sense of Absynth's 68-stage envelope generators and its 1800 sounds and effects settings?! In this very deep tutorial, Scott leaves no knob unturned! First, he takes you on a journey through the history of Absynth from its groundbreaking beginnings to its present day configuration. From there he's off and running, uncovering Absynth's plethora of advanced features and its new easy-to-use Mutator sound generation technology. He covers the browser, its internal effects, spectrum editing, its matrix of modulators, the macros, audio modulation and lots, lots more. 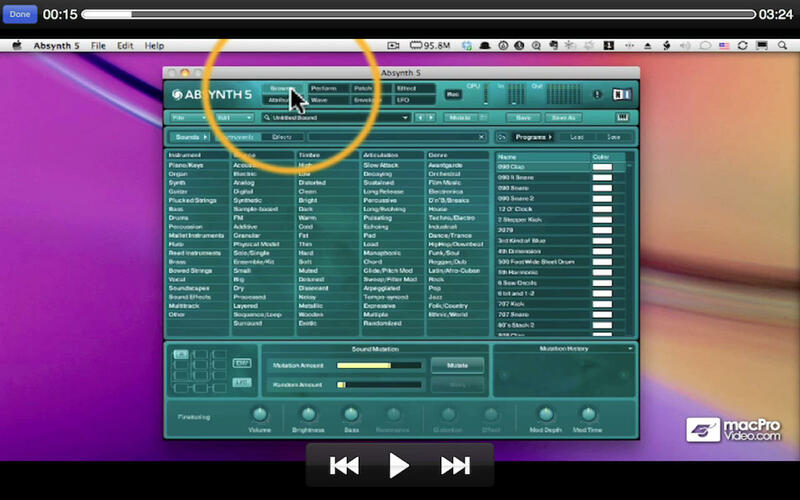 In fact, we at macProVideo.com guarantee that there isn't an Absynth tutorial like this one anywhere in the universe! So plug in to this Scott Freiman video masterpiece and see why Absolute Absynth is absolutely the most awesome, authentic, au courant authority on NI's audadious audio soft synth: Absynth!